A highlight on Sydney’s cultural calendar, UNSW Art & Design's ANNUAL Graduate Exhibition is Australia's largest and most diverse national showcase of graduate contemporary art, design and creative media work. Encompassing multi-site exhibitions across UNSW Art & Design’s Paddington Campus, the A&D ANNUAL 18 features an unmatched array of exciting new work from participating creatives, spanning animation, film, photography, sound, digital media, and graphic design, as well as painting, sculpture, object design, printmaking, textiles, spatial design, ceramics, jewellery, and more. This year up to 200 emerging creative practitioners will present their final projects across seven venues, including UNSW Galleries, Kudos Gallery, AD Space, Black Box, Interactive Media Lab, The Lecture Theatre and Makerspace: Virtual Reality Lab. We are always excited to reconnect with UNSW alumni on our Paddington campus. All UNSW alumni who RSVP will receive a free drink upon arrival. UNSW Galleries is the University of New South Wales contemporary art, media and design museum, encompassing the largest exhibition spaces located on the Art & Design Paddington campus. 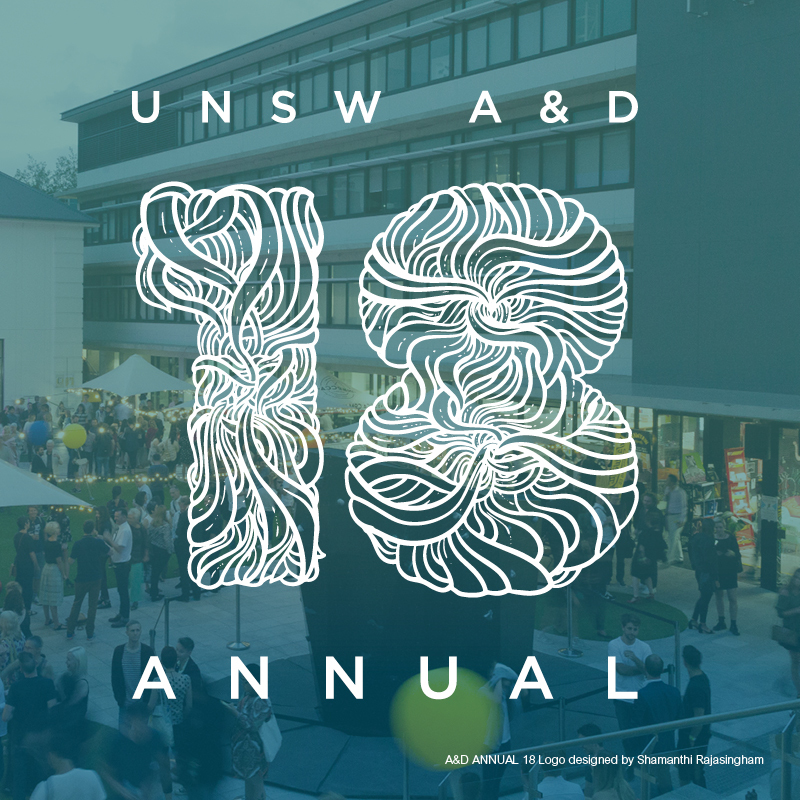 For the ANNUAL 18, UNSW Galleries showcases the broadest selection of creative disciplines, presenting Fine Arts and Design graduates as well as a screening of short films and single-channel video works from Media Arts graduates. Kudos Gallery is a dynamic off-campus gallery and exhibition space led by UNSW Art & Design students. As part of the ANNUAL 18, Kudos Gallery features a range of contemporary art projects from Master of Art graduates. AD Space is a unique on-campus exhibition space accessible to the UNSW Art & Design community. For this year’s ANNUAL, AD Space presents a selection of innovative studio projects from Master of Design graduates who are responding to global issues identified in UNSW's Grand Challenges Program. Location: E Block, UNSW Art & Design, Cnr Oxford St & Greens Rd, Paddington. Black Box is a large volume multimedia production space at UNSW Art & Design. As part of the ANNUAL 18, the Black Box showcases installations engaging with new media and technology from Media Arts graduates. Location: D Block, UNSW Art & Design, Cnr Oxford St & Greens Rd, Paddington. Interactive Media Lab is a new creative hub at UNSW Art & Design encouraging experimentation with media and interactive technologies. For the first time, the IML will become a site of the ANNUAL 18 to feature Media Arts graduates who are creatively exploring the possibilities of technology and interactive media. Location: A Block, UNSW Art & Design, Cnr Oxford St & Greens Rd, Paddington. Makerspace: Virtual Reality Lab is a platform for collaborative making, seeking to dissolve gaps between disciplines of art, design, science, technology, and engineering. For the ANNUAL 18, the Virtual Reality Lab presents Media Arts graduates experimenting with VR experiences and technologies in their final projects. Logo designed by Shamanthi Rajasingham.